Professor Stephen Holloway is Pro-Vice-Chancellor for Partnerships, Civic Engagement and Enterprise. “The Silk Road was created during the Chinese Han Dynasty just over two thousand years ago and, as the name suggests, it was the expressway bringing silk from China to Europe. It was, of course, much more than that as it opened up trading and cultural exchange, not only between China and Europe but for all of the countries that the route passed through. The Road was not just a single entity but a network of routes, some by land and some by sea, but it is generally accepted that the eastern hub was Xi’an, almost the mathematical centre of gravity for China although, for some unknown reason, is referred to as being in the north-west of this giant land. Xi’an is also the home of our partner university, Xi’an Jiaotong University (XJTU) with whom we co-created Xi’an Jiaotong Liverpool University (XJTLU) in 2006, located in Suzhou, approximately 1300km east of Xi’an, near Shanghai. In September 2013, the Chinese leader Xi Jinping, unveiled a new trading initiative ‘One Belt, One Road’, which breathes 21st century life into the former Silk Road, providing a framework for east-west trade by land and sea. Unsurprisingly, and with foresight, XJTU has used this framework as a springboard to launch an academic initiative which brings together universities along the Road to co-operate in internationalising research, education and innovation. I travelled to Xi’an, at the launch of the Universities Alliance of the New Silk Road (UANSR), with delegates from over 60 other universities, Liverpool being the most westerly, and with a rather large number of Russian universities also. Xi Jinping announced in October 2014 that a fund of $40 billion will be created to invest in business development along the Road, rather than providing grants or loans for specific projects. The universities in Liverpool have been successful in raising funds to create companies, jobs and retain graduates, driving economic growth and thereby prosperity for the region. XJTU also sees this as an opportunity to expand these activities and has embarked on the development of a vast new campus for graduate education but with innovation and the translation of its research at its heart. As an existing strategic partner, the University was invited to take part in the formal opening ceremony of the UANSR and along with Peng Tian, a most amiable and generous travelling companion, from the Liverpool Confucius Institute, I arrived to a warm welcome in Xi’an. 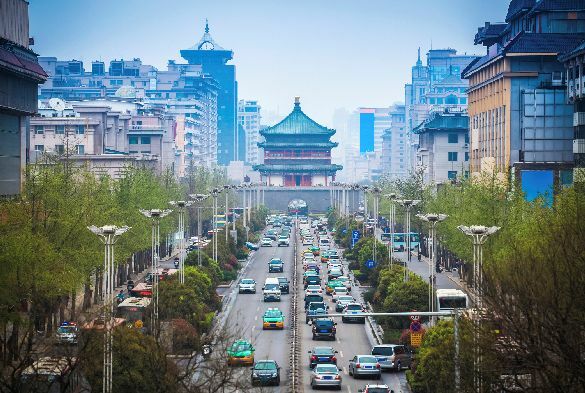 Xi’an is a city approximately ten times larger than Liverpool with a population of eight million. It is an ancient city and became the cultural and political cradle of China from the time of the Zhou dynasty (1000 BC) on and off through to the Qing Dynasty (17th century). It is well known as the home of the Terracotta Army, constructed by Qin Shi Huang, the first emperor of a united China, as part of his mausoleum (around 210 BC) and along with the Silk Road itself is a UNESCO World Heritage Site. The inauguration ceremony of the UANSR was full of pomp and speeches extolling the great virtues of universities collaborating on this exciting project. In the evening there was a wonderful concert for bridging art and science, which was held at the Xi’an Conservatory of Music and comprised eight or nine European classical pieces played by assorted soloists backed by the in-house chamber orchestra. The quality of the performance was truly outstanding but the event was made unforgettable by the charming host for the evening and Professor Xiaohong Guan from the XJTU Department of electrical engineering. An enthusiastic flautist and passionate music analyst, he described his research and discovery that in classical music, it appears that the frequency for certain tone-intervals can be well described by a power-law dependence! There are now a number of opportunities that the University could pursue under this initiative, which will further our relationship with XJTU across our core activities. Together we plan to create an innovation hub in Xi’an at their new Innovation Campus. This could help increase our business partnerships in Xi’an and also leverage existing relationships with companies on the Suzhou Industrial park. For more information about University of Liverpool international research and education activities, please contact the International Development Office (IDO).